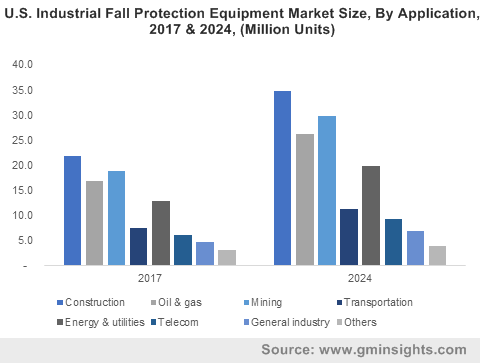 Industrial Fall Protection Equipment Market size was over USD 2 billion in 2017 and industry expects consumption at over 510 million units by 2024. Growing concern towards employees’ safety along with increasing industry fatalities should drive industrial fall protection equipment market size. Safety standards by regulatory agencies, including OSHA and ANSI regarding the health and safety of workers should fuel the product demand. Rapid industrialization along with skilled labour requirements may augment personal protective equipment market demand, thereby boosting industry growth over the forecast timeframe. Increasing construction and infrastructure projects in India, China, and the U.S. may create immense opportunities for market expansion. Falls are the major cause of worker fatalities rate in the construction sector. As per OSHA, construction related falls resulted in about 150 to 200 deaths and 100,000 injuries every year. Rise in new infrastructure projects for the development of commercial & residential building may witness considerable gains in fall protection equipment market demand. Construction spending in China exceeded at over USD 2 trillion in 2017. Stringent enforcement of health & safety regulations in the industry, with increase in construction activities, and renovation projects may further boost market growth. The Chinese government is spending more on building the infrastructure network, railway, highway, subway, and airport projects. According to Bureau of Labor Statistics Census reported fatal occupational injuries, which were approximately 5,000 in 2017. As per OSHA, general industry incidents involve slips, trips, and falls which causes about 15% of all accidental deaths and thereby increasing the fatalities rate which in turn may boost the overall market demand. Sale of inexpensive and low quality & substandard products accompanied with lack of consumer awareness is likely to hamper market demand. Also, non-compliance with various regulations & standards by the industrial participants is the main restraining factors for the industry faced by the manufacturers. However, regulatory bodies mandate that employers shall provide a training program for each employee, who might be exposed to fall hazards. 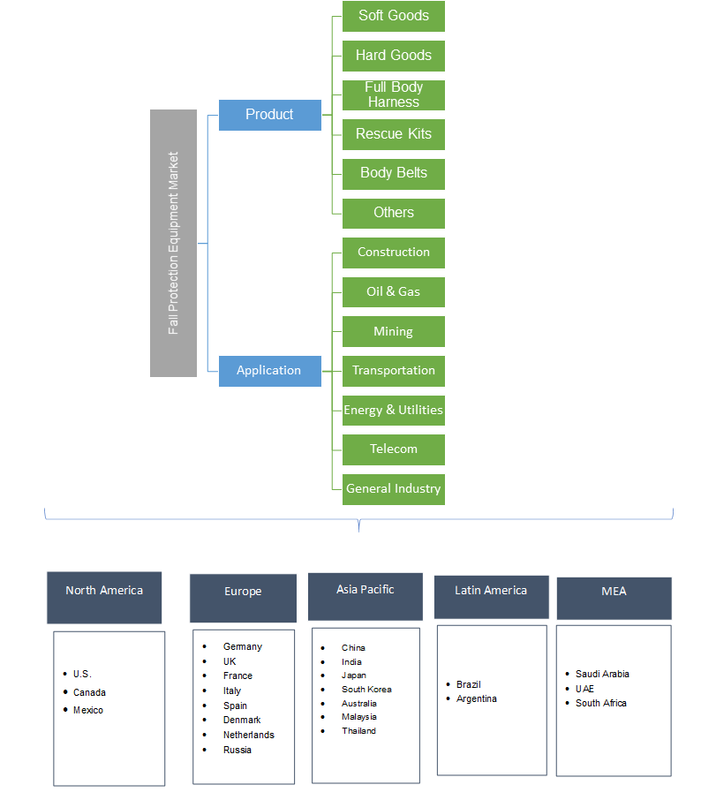 Industrial fall protection equipment soft goods market size is estimated to reach up to USD 30 million within the forecasted timeline. Advancement in technology with manufacturers developing materials in soft goods to increase durability, may enhance product demand. Lanyards offer elastic properties for averting falls and increases comfort and decrease product weight. Rescue kits for industrial fall protection equipment market size is likely to register gains at about 6.5% by 2024. They are designed to raise or lower single person mainly suitable for rescue from retractable lifelines and lanyards. These are in compliance with OSHA and ANSI standards which lowers the risk of fallen worker, thereby promoting market demand. Full body harness for industrial fall protection equipment market demand may witness significant growth at about 7.5% owing to worker’s safety and reduce workplace hazards. It has wide application usage in construction, mining, and energy industries where they are designed to reduce fatigue and allow users to perform duties. Industrial fall protection equipment market demand from construction application may surpass USD 900 million by 2024. High fatality rates in the construction sector owing to cluttered, slippery, or unstable working surfaces, floor holes, unprotected edges, and wall openings along with stringent enforcement of health & safety regulations and project renovations may have a positive influence on the industry growth. Mining industry may witness significant gains at over 7% within the projected timeframe. As per MSHA (Mine Safety and Health Administration), slips and falls are major causes of mining mishaps. These fatalities are encountered mostly due to improper usage of arrest systems and lack of product information. Ensuring miner safety and productivity requires comprehensive fall prevention strategy implementation, which includes personnel training, and partnering with companies that prevents the mine’s potential fall hazards. Industrial fall protection equipment market demand from energy & utilities application is poised to exceed USD 550 million by 2024. Rising demand for renewable sources such as wind energy coupled with windmill maintenance and construction may favor product demand. It requires the crew to conduct operations hundreds of feet above the ground, necessitating the usage of harnesses, vertical systems, climbing systems, and lanyards, thereby boosting overall industry growth. North America driven by Mexico, Canada and the U.S. industrial fall protection equipment market size may register gains at around 6% over the foreseeable timeframe. Increasing mandates by government agencies to follow various PPE standards at workplace to reduce fatalities rate and increase worker’s protection should favor regional growth demand. Europe led by France, UK, Italy and Germany industrial fall protection equipment market demand may surpass USD 900 million during forecast period. Authorities such as the Health & Safety Executive (HSE) work towards mandating workers safety and welfare. HSE carries out inspection and boosts compliance with health & safety law and takes initiatives to create awareness about hazards and reduce work-related injuries favoring industry growth in the region. Asia Pacific led by Japan, India, Australia, and China industrial fall protection equipment market size is likely to register significant gains at over 8.5% by 2024. Rise in infrastructure spending along with rapid industrialization has led to increase in various manufacturing industries, which may accelerate regional industry growth. Building & construction sector may see an uptrend due to increasing government regulations regarding energy-efficient and smart building technologies. Global industrial fall protection market share is significantly consolidated and competitive with top five companies comprising over 90% of the total demand. 3M, MSA Safety Company, Capital Safety, SKYLOTEC, and Honeywell Miller are the prominent manufacturer. Most of the manufacturers have adopted e-commerce and sell their products online which enables companies to reduce their operational costs and achieve increased sales by targeting a global client base. Further, companies are engaged in collaborations and partnerships to expand regional presence and focus on new product development to gain competitive advantage. Conventions regarding workers’ safety and health issues & practices such as Total Quality Management (TQM) have propelled market demand, making it mandatory for industries to comply with rules regarding employee’s safety at workplace. Upper management in industrial firms becoming proactive regarding workers’ safety. Strict government guidelines and frameworks in the U.S., Germany, and the UK have led companies to follow certain guidelines and rules to avoid any form of occupational hazards. Strong R&D spending and increasing number of oil & gas, energy, mining and construction industries may propel overall industry demand.